The seed defaults to 1 and is usually 1. It can however been any value that fits in the data type. Negative increments can be handy if your identity column has reached the max value of the data type. Reseed to 0 (assuming that is where you started) and set your increment to -1. If you want to insert a specific value into the identity column you have to use the IDENTITY_INSERT setting. To insert a value into the identity column you must list the columns in the insert statement. One thing is not correct I think. “To insert a row into a table with an identity column you must list the columns”. One always should list the columns though, but SQL Server won’t mind if one omits it. Actually that was a typo. It was supposed to be “To insert a value into the identity column you must list the columns in the insert statement.” I’ll get it changed. Thanks for pointing it out. Mr. Celko and I have disagreed in the past so I’m not to worried about it :). I will say you should use identity columns as the PK only when it’s appropriate. Also that seeing an identity column that isn’t the PK has been fairly unusual in my experience. Good list. Might add about using identity in a select into. Another, more distant, would be identity ranges in transactional replication. Would you believe in 15+ years of SQL I’ve never dealt with identity ranges in transactional replication much. Also I’m not entirely sure what you mean by the SELECT INTO? Would you mind commenting or emailing me a couple of bullet points for me to add? It’s a way to add an identity to a table you’re creating on fly, instead of having to define it first. Something like SELECT identity(int, 1,1) as MyID, name from sys.databases would create the table with MyID as an identity. Identity in replication is not bad, system handles for you, but it does some tricks to reserve ranges and if you run out of keys in the range, then inserts stop – has to phone home for new range, or you get to live big and pick one, clean up the mess later! Excellent addition! I’ll add it. Would you believe it was in there (I was surprised I’d missed it). I had just fat fingered it and put “SCOPE_CURRENT”. That’s what you get when you copy and paste I guess. Thanks again! A succinct refresher on SQL Server IDENTITY columns. I believe a Truncate Table statement will reset the identity value back to the original seed. Thanks for the list! IDENT_CURRENT() should be used with tremendous caution. Aside from the obvious concurrency problems, unless you have been granted permission on that table (not recommended in a Production environment), the function will return NULL. Also, you should be aware of the infamous gaps when the IDENTITY is reseeded by 1000 every time you restart server (SQL Server 2012 and 2014). Thanks Anthony and Ypercube. I’ve added your additions to the list. Take a look at the following URL about the identity function, though. The code you list in the article is incorrect. The IDENTITY function only works in a SELECT/INTO and it always requires at least the datatype. Thanks! Sorry about the confusion. I’ve never used it before :). It’s corrected. At least I hope I got it right this time. Better use OUTPUT to get the values. I agree. I talked about that here: https://sqlstudies.com/2013/06/26/using-output-to-back-up-a-change/ I’m not sure what you mean in this context though? OUTPUT is the best and safest way to get the identity values. “A primary key that’s an identity column is called a surrogate key”. Not necessarily. A surrogate is a key that is not used as an identifier in the business domain. IDENTITY is frequently used as a surrogate but IDENTITY columns are sometimes also used for business identifiers such as order numbers – i.e. business keys, rather than surrogates. I’m not saying that’s a good idea, IMO it generally isn’t, but we can’t assume that an IDENTITY column is necessarily a surrogate. Very good point. Better to say “A primary key that’s an identity column is usually a surrogate key.” I’ll get it changed. Thanks for the comment! What if two simultaneous(same time) inserts happen into a table with Identity column, will it create different Identities for each inserts or will it reject/fail in case of simultaneous/parallel inserts. Technically there can’t be two simultaneous inserts. Even if it seems like it to us only one can be written at a time. One or the other will get a lock on the page containing the next ID value. It will get that value, write the row, and then release the lock. In the mean time the other insert will be waiting on the lock to be released. Once it has then it will get it’s next identity value. Is it possible to get the Identity field value before it commits so that a value based on it can be loaded into another field? e.g. Identity field is IncidentN and is about to get the value 234 when the insert commits, and at the same time I want to insert 00000234 into the IncidentID field which is Not Null and Unique. Effectively what I’m asking is at what point does the Identity field get its value. (I’m a MS Access programmer used to having an AutoNumber field value as soon as the user starts to create a new record in a form .. i.e. OnInsert and prior to the commit). I believe the identity value is created during the actual insert. Which means that at best you will need to insert a false value and then update it (even if you use a trigger). Another option is to use a Sequence object. It will let you get the next value before your insert. It’s similar to using an identity column but is not tied to the table and requires some additional manual work. Probably best for what you are trying to do however. Does the identity column jump records in SQL Server 2014 or is this issue just with 2012? Thank you! I haven’t noticed it jump records in 2014 or 2012? Now there is no guarantee that it will be sequential, and there are a number of reasons why it might not be (deletes etc) but I’ve never seen it just randomly skip a range of values. 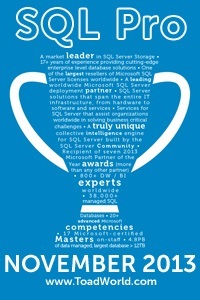 We have SQL Server 2012. We use a software called INFOR EAM and many entities in EAM are based on Sequences with Identity columns in SQL Server 2012. The last time we restarted the server, our Work Order numbers incremented by 10k. I am trying to find out if upgrading to SQL Server 2014 eliminates this issue. I’d try to figure out why the increment. I can’t think of any reason why a restart of the server would change the increment of an identity column. Or a sequence for that matter. Is it possible there was a piece of code running when the server was restarted that had requested a range from a sequence? Is identity value jumping issue also in SQL server 2008 instance restart? And I just realized you were probably asking if that jump also occurred in previous versions of SQL. As I understand it yes, it’s always been this way.